About PowersTM: From its earliest days as the Powers Regulator Company, Powers has been an innovator in the area of temperature control. The company was established in 1891, a few years after founder, William Penn Powers, invented the Vapor Disk Thermostat. 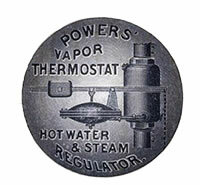 This product innovation, the grandfather of today's room thermostat, was unveiled at The Chicago World's Fair in 1893. The company would later expand on this technology, and come to dominate automatic temperature control for commercial buildings. Leveraging their core competency in temperature control, The Powers Regulator Company developed the first modern Pressure Balance Valve in 1924, bringing bather safety and comfort to modern plumbing. Over the past hundred years, Powers has continued to pursue a tradition of product innovation. Today the company holds patents on technologies that serve as the backbone for many products serving the commercial and industrial temperature control markets. PowersTM has gone through several name changes and product splits over their 100+ year history, and produces some of the finest, quality equipment from commercial shower applications to process grade valves and actuators. Some of the names you may know them by are: Powers Regulator, MCC Powers, Powers-Fiat, Powers Process Controls, Crane Powers and PowersTM, a Watts Industries Company. The PowersTM trademark is owned by PowersTM, a Division of Watts Water Technologies, Inc. M&M Control is a stocking distributor for PowersTM. 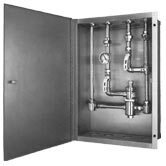 Valves: Self-operated regulators for heating, cooling, by-pass and mixing applications. Utility bronze or iron body control valves featuring brass and stainless trim for steam/water modulation, mixing or by-pass applications. Iron body control valves featuring bronze and EPDM trim for steam and water modulating applications with moderate pressure drops. Industrial Controls: Accritem Rigid and Remote Bulb Blind Controllers. Process Controllers by Moore Industries (formerly PowersTM Products) precisely control and monitor a temperature, pressure, level, or flow process variable in batch and continuous processes, or back up critical or safety-related loops controlled by PLC, DCS and PC-based systems. 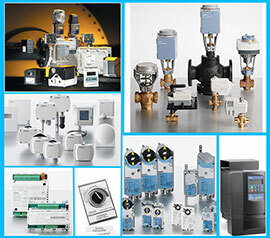 Siemens is a leader in pneumatic and electronic systems for the control of HVAC and process applications. Built to last, some of these commercial grade products have been around in some form or another for over one hundred years. Landis & Staefa, PowersTM, MCC PowersTM, Landis + Gyr, Siemens Building Technologies: Whatever you may call them, M&M has the product in stock and at a competitive price! M&M recently bought the remaining stock and the rights to manufacture the Series 200 Temperature and Pressure controller. We have Pilot Valves, Thermal Systems, Complete units and a wide variety of parts available. Please contact us for price and availability.